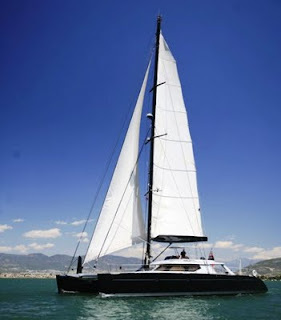 The 73' Yapluka Catamaran, Wonderful was built in 2004 and refit in 2008. With an overall length of 73ft and cruising range of 1000 miles traveling at 13 knots allows most sailing ports in the Caribbean easy to explore. The luxury catamaran, Wonderful will be available in the Caribbean for 2009 - 2010 including the British Virgin Islands, Leeward Islands, St Barts, Barbuda and Antigua, and also the Grenadines. The Interior was designed in mind for eight guests and three crew. with four guest staterooms and two crew cabins. The owners cabin converts into a suite if required and 1 other cabin converts into a double berth. All cabins are dressed with all the refinements one would expect on a yacht of this standard and include Flat screen TVs, Playstation II for watching DVDs, listening to music and playing games. Each Cabin has an Ethernet network socket for connecting portable computers to the ships main computer for Internet access. The yachts Satellite TV system will provide over 100 channels.